While Google improves its usability by incorporating structured data into search result pages, Bing takes a bigger, and somewhat similar approach. Bing, it seems, has finally started to catch up, and is now providing features Google captivated its users with for so long - probably even taking them a step further. For its latest feature, Bing will now show full song lyrics on its search results page in much the same way as Google shows information on its Knowledge Graph! Although just available in the U.S for now, Bing plans to roll out the feature for the rest of the world in the coming months. 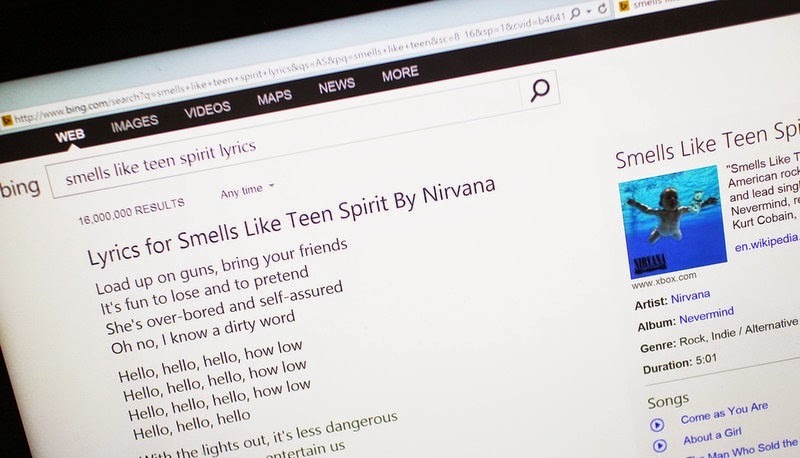 According to Bing, lyrics are available for more than 500,000 songs and counting. When you search for a song lyrics, (query like [In the end lyrics]), Bing shows a part of the song with a link to expand it when available. And in a typical knowledge graph fashion, you can see more song/artist information (wikipedia) on the right side. Currently, Bing is picking up lyrics from a site called LyricFind. These lyrics are from varied genres, and according to Bing, LyricFind is licensed to use the lyrics, and that license extends to Bing’s display. What to make of this update? Song lyrics are generally a very popular type of search queries. And the numbers are obviously significant - significant enough for Bing. A lot of lyrics website that - even while ranking well in search engines - are poor in user-experience, and it takes users many clicks to get to the lyrics they want. So in that regard, Bing has done well to normalize the experience for searchers and make it easy to find lyrics. On the other hand, the lyrics are on these sites are rife with mistakes. Often, these sites parrot what's on other sites, or what shows up in an album's inner notes. 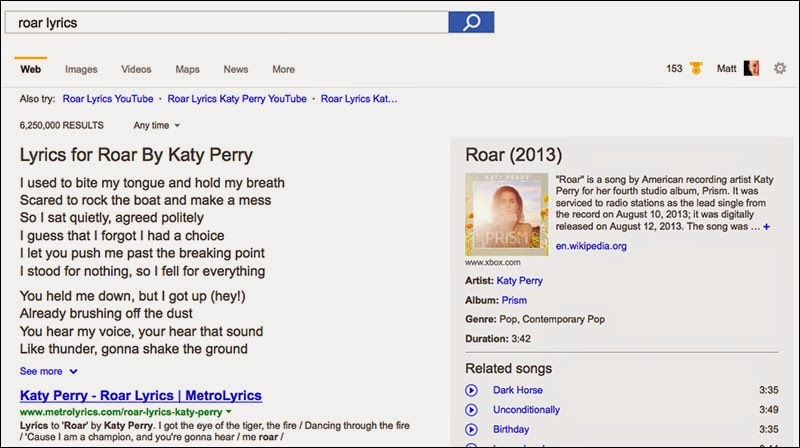 The actual transcriptions of a song might be different, which casts a shadow over Bing's lyric search. You might say that it doesn’t really matter if every single word in a song lyric be accurate, but if search engines are going to show content, data and facts in their search results, we should expect it to be accurate, no matter if it’s song lyrics or medical information. Rules are rules, yes? The other obvious implication here surrounds search traffic to lyrics sites. According to comScore estimates for August, Bing has less than one-third the search market share that Google has, so Bing’s move may not cause a lot of harm. But imagine if Google were to start showing full song lyrics in its search results… is that something we'll see eventually, now that Bing has taken the lead? The question poses a real threat to lyrics sites that host millions of song lyrics and get hundreds of thousands of hits daily.